In this Dakine Split Roller Review, you’ll find out why I think the Dakine Split Roller is just about the best luggage bag money can buy. 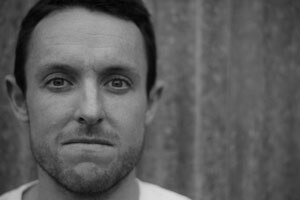 I’ve travelled overseas many times now; not just for cycling trips but on work, holidays and snowboarding trips. I’m obsessive about good products that have great function and practical use, are robust and are constructed with real users in mind. 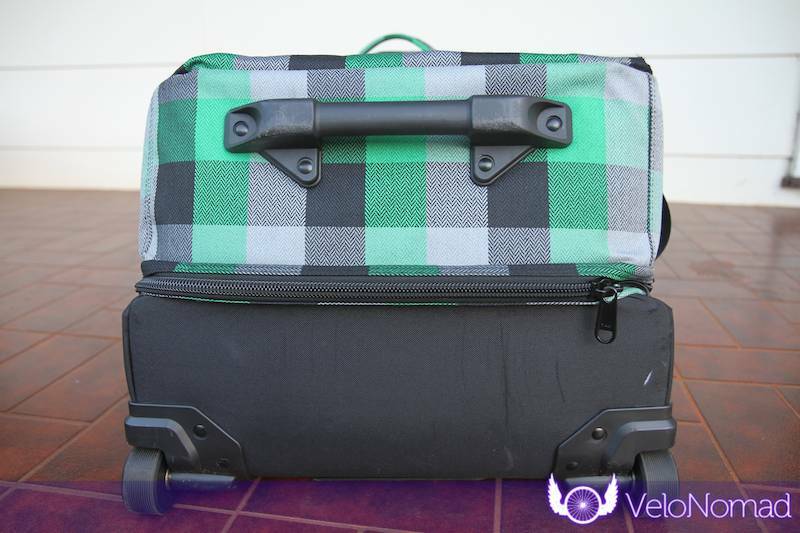 One thing that is super important is having a good luggage bag. Storage volume isn’t a consideration as far as I am concerned, because if you need more storage, buy a bigger bag (or pack lighter!). 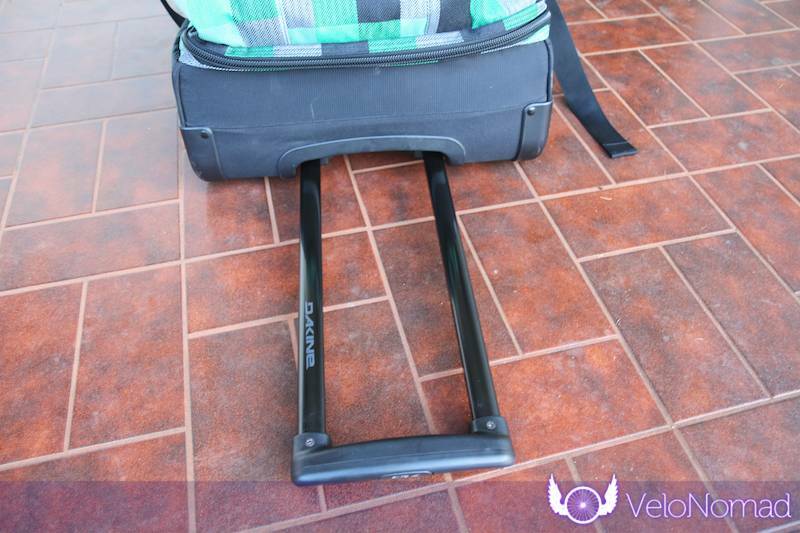 In any case, if you’re travelling with your bike, you can put some stuff (like knicks) in with your bike anyway. I’ve travelled extensively with an FCS Long Haul (an older version of this) and the wheels were hopeless. The material was tough and it had wet compartments which were awesome. Wet compartments are compartments lined with surfboard bag material so are good for, well, wet stuff. So let’s look at the 100 litre (100L) version of the Dakine split roller. There’s also a smaller 65L version available. 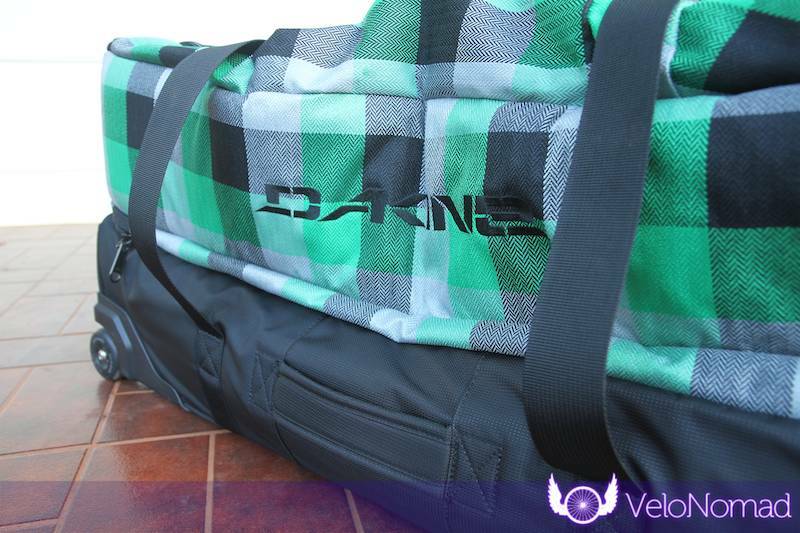 The Dakine Split Roller (this is a 100L version) is an awesome bag. It’s practical, well thought out and very robust. As an added bonus it comes in AWESOME colours which makes it easy to spot at the airport on the carousel. 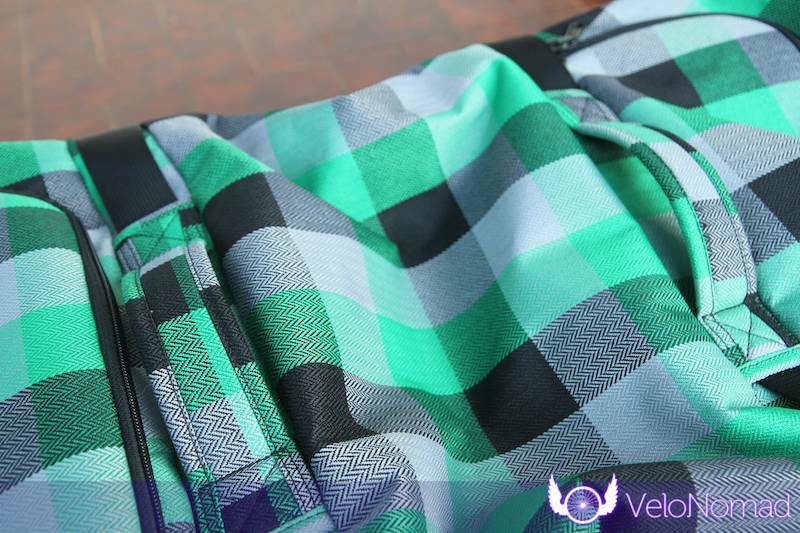 Forget black (though I’m all about stealthy black bikes), go the fuschia or green argyle! 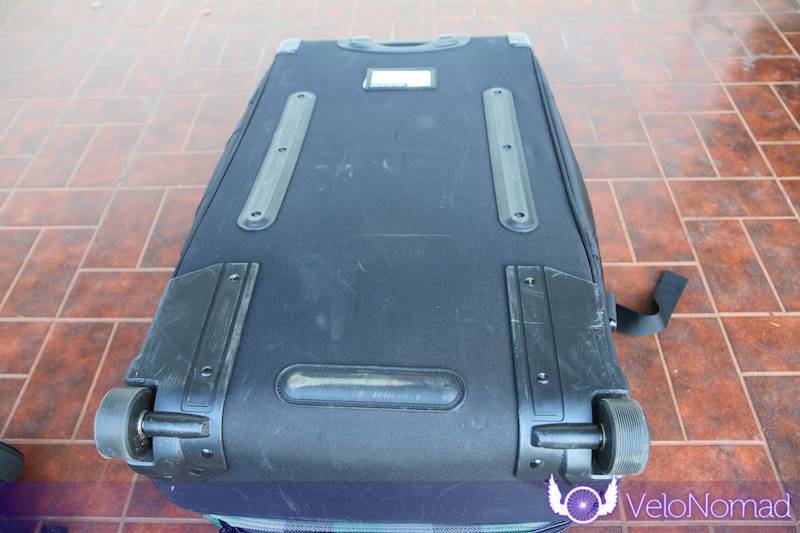 Let’s look at why the Dakine Split Roller is the best luggage bag I’ve used. 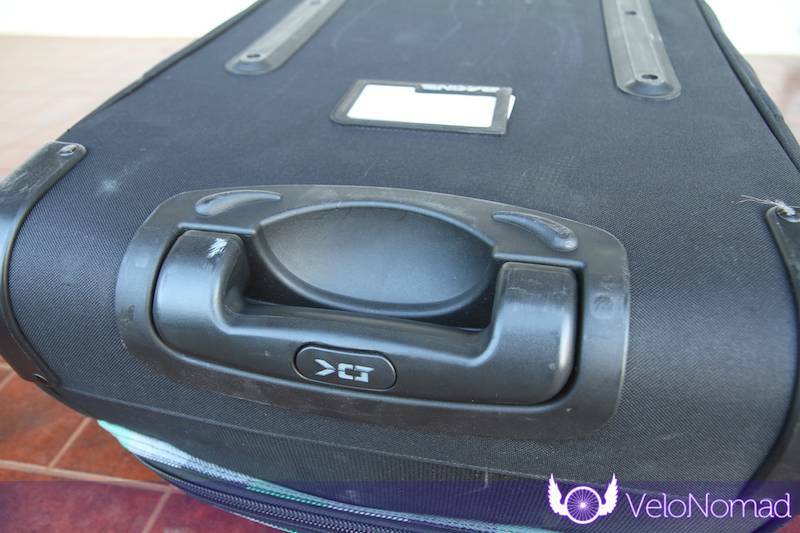 The clamshell/split design is my preference for luggage as it makes access to the bag a breeze; no need to get into the bag by pulling stuff out. There are 4 interior compartments; a single large one on the bottom/base, and 2 x small and 1 mid sized one in the lid. 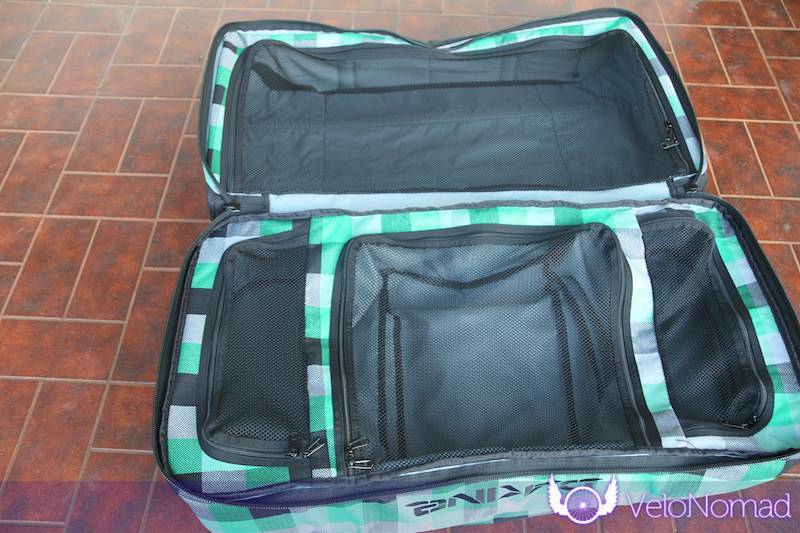 All compartments have a mesh zipped “lid”, so you can see in to the compartment when it’s closed. The small ones are good for stuff like socks and jocks and other ancillary daily needs. The mid sized one is probably good for tshirts and everything else can go in the bottom one. You might consider using extra packing cells (like these ones from Kathmandu) which are a great way to further compartmentalise your belongings (I hate disorder in my luggage!). The bottom compartment will fit two large packing cells and the top middle compartment will fit one. There are two small exterior stash pockets which won’t store much; perhaps some paperwork or dirty washing. 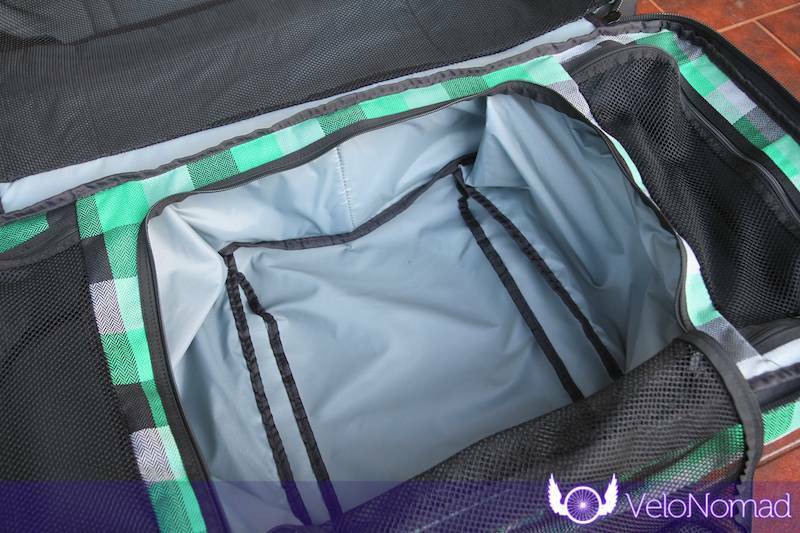 One thing that is a negative for this bag is that there’s only one way into the bag – through the clamshell zip. The FCS Longhaul has an external access zipper so you can get into the top clamshell of the bag which proves to be very useful. I’m all about agility in airports and when in transit. Anything that’s easy to move around in tight spaces is highly desirable. The Dakine Split Roller is fairly agile/portable. 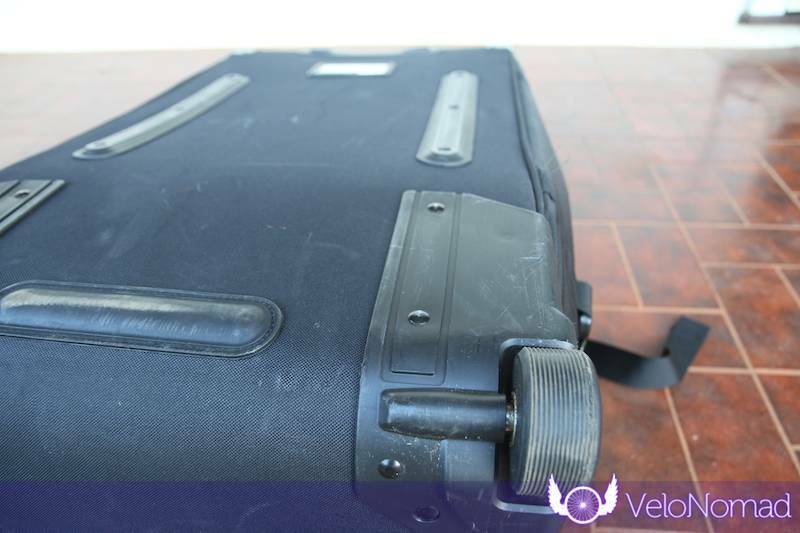 It doesn’t have 4 wheels on the bottom corners (like, for instance, a hard shell Samsonite suitcase or equivalent) so you can’t just move it around whilst it’s fully upright. So, it suffers in that regard as it means you need to pack it in a balanced manner to ensure it doesn’t tip over when standing up. 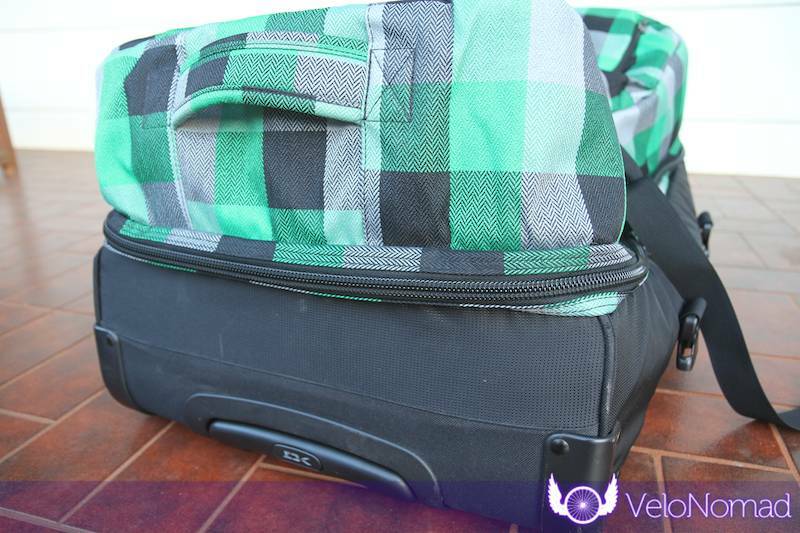 If you pack light enough though you’ll be able to lug it around without a hassle. The wheels are replaceable urethane skateboard-like wheels. Not only are they tough (and almost never will crack), they’re attached to the bag in a pretty bombproof manner. The fact that they’re fully recessed and only protrude from the bag as much as needed is a big plus as they gain protection from the bag proper. 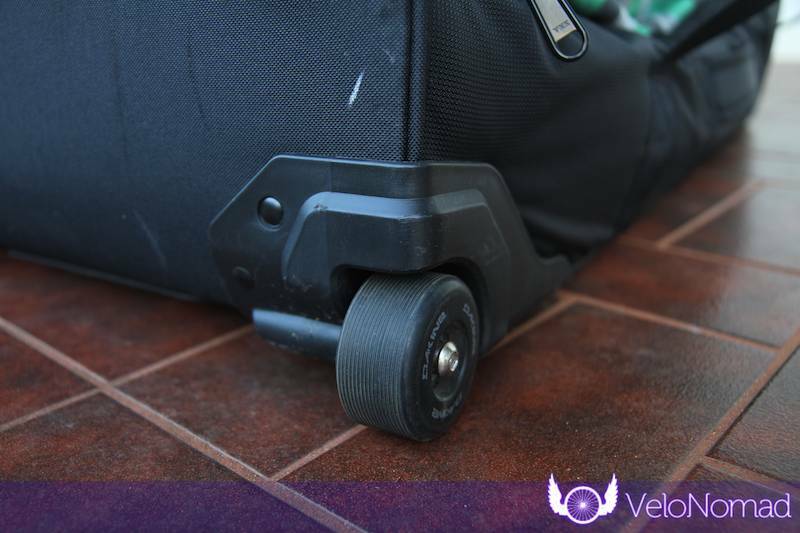 My FCS bag wheels were flimsy things attached to a small corner piece of plastic which broke on the first trip. 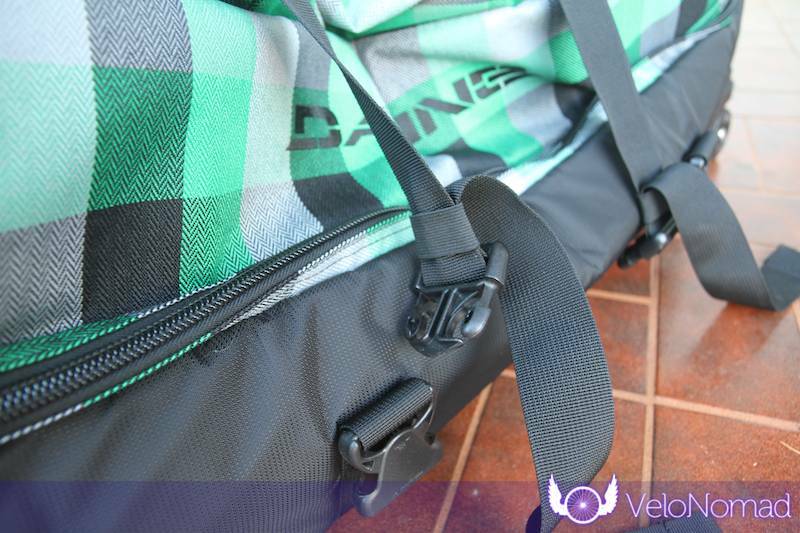 The Dakine in contrast, has quite a good housing around the wheels. The Dakine has been taken to France and Spain, and domestically numerous times and apart from a few scratches, the wheels are totally fine. The extendable handle is pretty standard these days and isn’t really open to innovation. The Dakine handle is pulled out after pressing a little button which acts as a latch; this is a neat feature. The handle itself is as sturdy as can be expected. 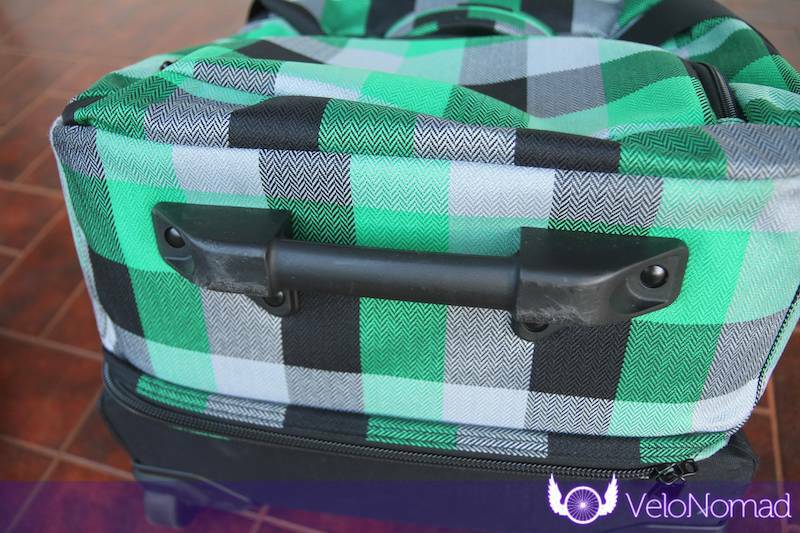 As long as you don’t pack your bag full of something heavy – like rocks – the handle should be fine under normal use. The Dakine Split Roller is marketed as being environmentally friendly by dint of being 100% PVC free. 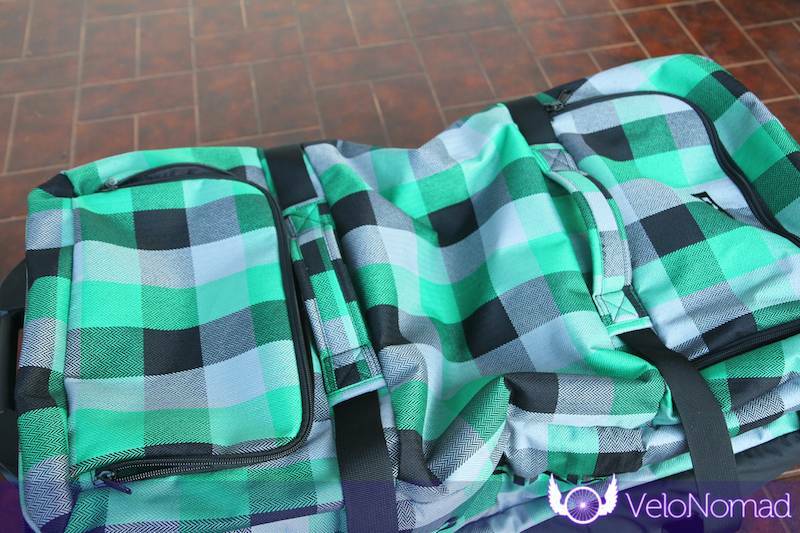 It uses recycled PET, 420D Nylon and 600D Polyester. 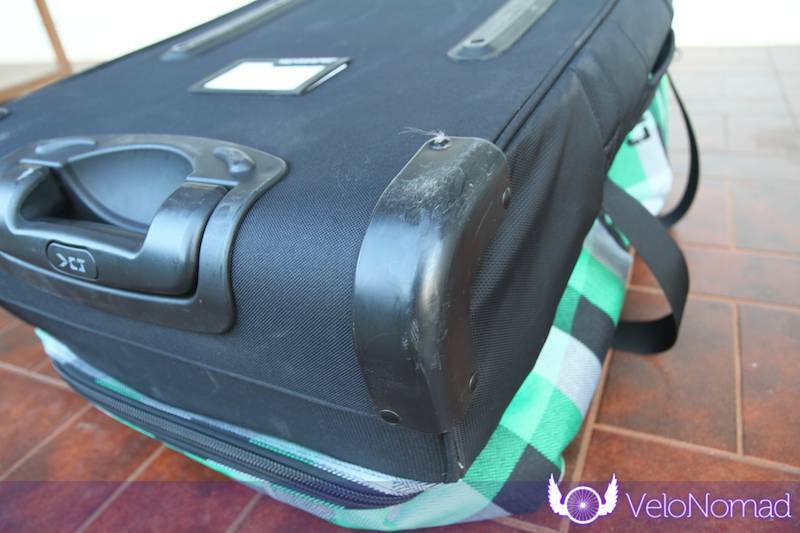 The outer material is very tough – my bag does not have any tears or scratches after multiple trips. The inner material (lining) of the outer is almost like rubber, I think this is the PET and it feels very robust. The base has plenty of plastic rails to keep the material off the ground and protect it. On the bottom of the bag, both halves have a hard insert to prevent the bag collapsing or being squashed in transit. This protective shell extends around the bag and about 1/3 of the way up the sides (awesome if you’re bringing home many litres of cheap Euro Bacardi or Chivas bottles!). On the bottom of bag – there’s a sturdy plastic handle that doubles as a bash guard and stand. 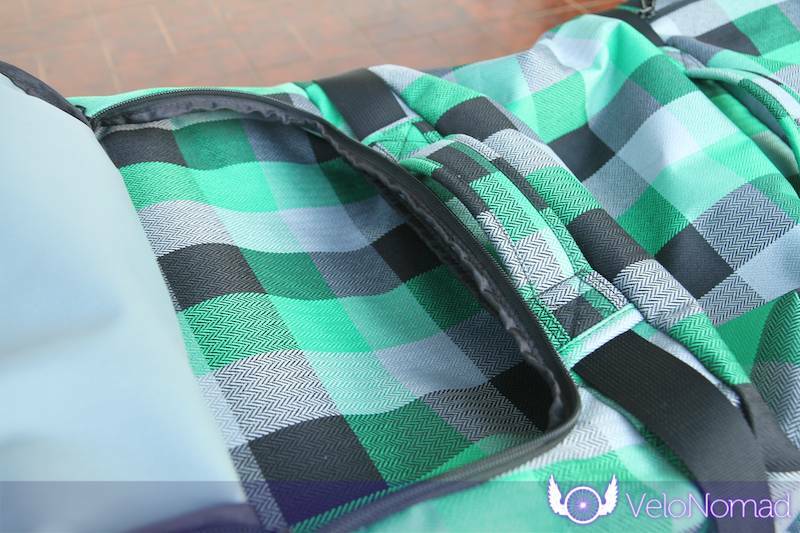 The material on the bottom half (clamshell) of the bag is a scuff proof-type of material. Clearly Dakine have not cut corners in the zip department. All zips are YKK zips and all zip lines are double zipped including internal compartments(!) which is awesome, as single zips are a pain. The external zips are large gauge, and are capable of being padlocked (the internals are not). 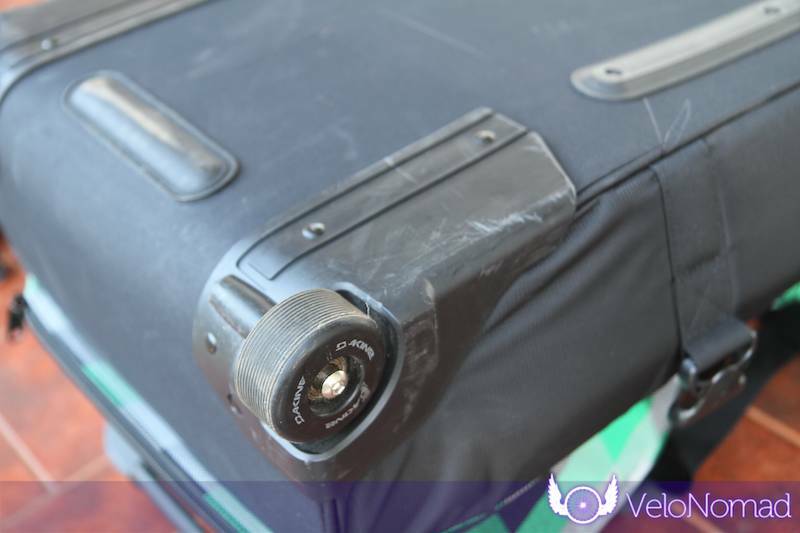 Be careful when locking the zips – use TSA approved locks even if not travelling via the USA. 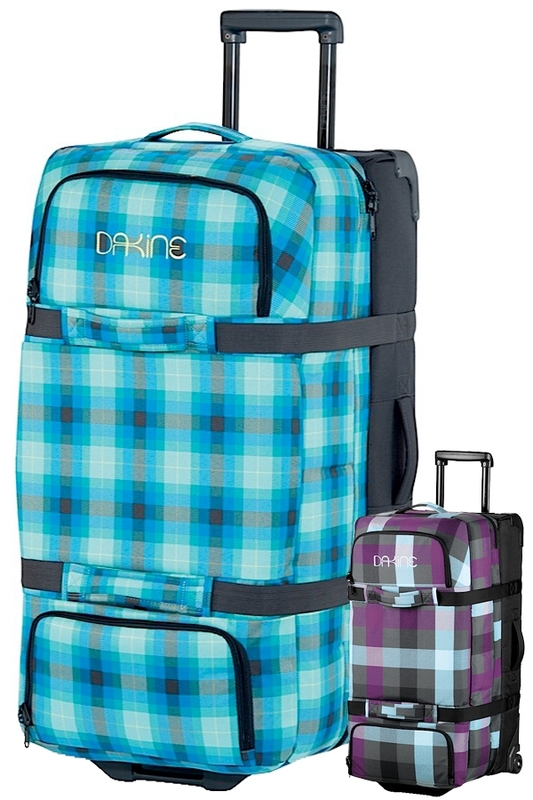 One thing that I – and probably baggage handlers – love about the Dakine Split Roller is the number of handles. Handle on the top end, bottom end (plastic, that doubles as a stand), side and front/top, make for a bag that’s easy to pick up and move around. 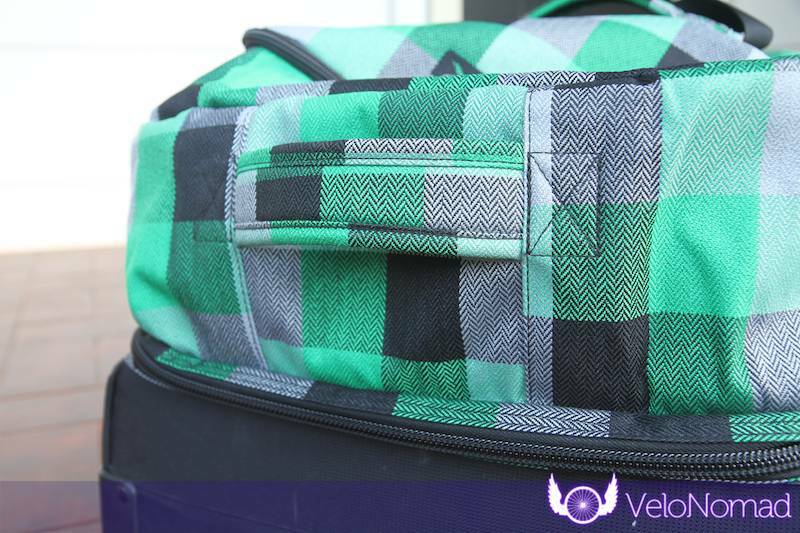 All the handles are double stitched, extra padded and accommodate most lifting situations. The two handles on the top of the bag (when it’s sitting on the ground flat) have two straps running through them that allow you to flatten and compress the bag in transit and when the bag is in storage. I think these are removable too. This bag is just designed very well. It is ridiculously good value for money considering its longevity, features and price. Kate said “I just love this bag and I am so glad I got it”, and I am too. I paid for this bag and would happily for another one. I think you’ll be equally happy with the Dakine Split Roller. If you liked this Dakine Split Roller review, I’d appreciate if you clicked through to Chain Reaction Cycles using the following link* to purchase the Dakine Split Roller. ==> Purchase the Dakine Split Roller. Chain Reaction Cycles is about the only major cycling related website stocking the Dakine Split Roller at the time of publishing. I looked at this bag and it’s awesome. Only thing I’m wanting on it is another two wheels. Do you know any bags with 4 wheels that are surf/skate/snow (etc) brands? Hey Luke, not off the top of my head, sorry! Hi. Had the 65 litre version two months. Looks great and love the concept. Thanks Nick – I would buy another one for sure. Next Post: Power meters for training – are they worth it?